The graph shows consumer spending on recorded music in the U.S. The average per person spending amounted to 40.75 US dollars per person in 2007. The figures presented above show actual consumer spending on record music for the period 2002 to 2008 and also include a forecast until 2012. This forecast was generated by Veronis Suhler Stevenson, a private equity company specialized in the media industry. 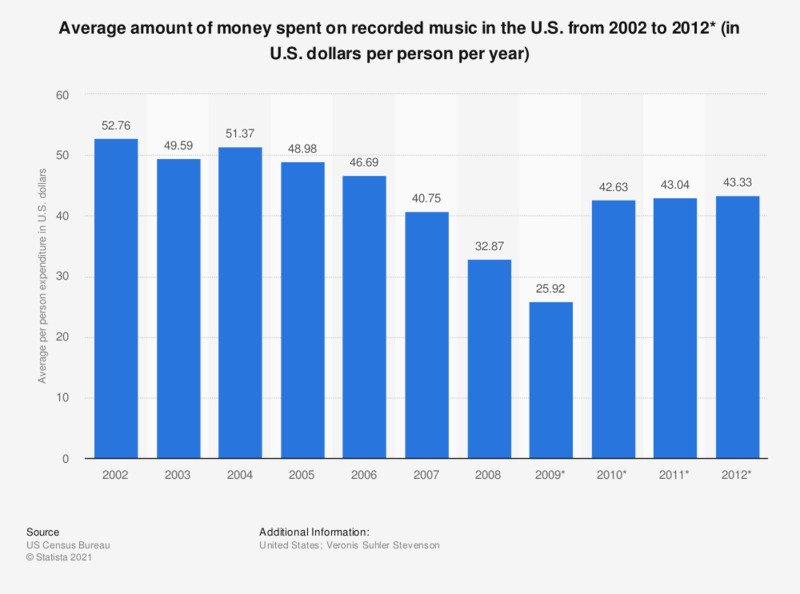 It has been estimated that the average American consumer spent nearly 52.8 US dollars on recorded music in 2002. In 2008, the figure amounted to 32.9 dollars, which signifies a decrease of nearly 20 dollars or 37 percent over a period of seven years. Veronis Suhler Stevenson projected that spending would drop further to 25.9 dollars in 2009 only to increase to over 42.6 dollar in the following year and continue growing until 2012. However, research carried out by the NPD Group in 2011 estimated that the actual 2011 spending was higher. The target group of the research were music buyers aged 18 to 35, who were divided into those, who used peer-to-peer services and these who did not. P2P users spent on average 63 US dollars on recorded music, whereas non-users spent only 55. In total, including live music and merchandise expenses the figures amounted to 206 and 138 dollars respectively. Results from different research show that music on physical carriers such as CDs made only 16 percent of all music acquisition volume in 2010 and 2011. Paid downloads accounted for 16 and 19 percent respectively. The remaining share was attributed to various means of unpaid acquisition. However, both 2011 and 2012 brought positive changes in unpaid music acquisition (which usually comes down to music piracy). The total volume of unpaid music acquisition contracted by almost a third in 2012, having already contracted by eight percent in 2011. * Values for 2009 to 2012 are projections.